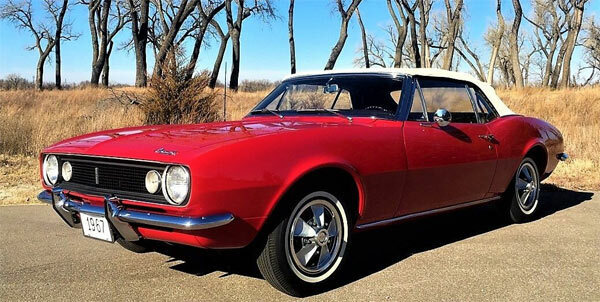 When I first saw the pricetag for this 67′ Camaro I thought like many would, ‘how much?! ?’, but then saw that this is 1 of 10 prototype survivors of the first Camaros ever built and the 13th prototype ever made. This red on black convertible is the fifth Pilot Prototype convertible, Order # 5A-26 made by Manufacturing Gear & Axle and carried the model # 12667. The car was used for promotional purposes and then sold in March 1967 to its first owner. The car still has plenty of its prototype features, but the exact list of these features will need to be verified on inspection. Rarity is one thing, but coupled with being a prototype in grade 1 condition, plenty of documentation and a fine looking vehicle in itself, make for a very unique car. Like all these things, it’s then a question of will somebody eventually pay the asking price. Clearly a piece of muscle car history with its own unique back story. The complete description of the car and its history can be found below, but suffice to say that a rarity such as this in prime condition, has its own unique pricetag. 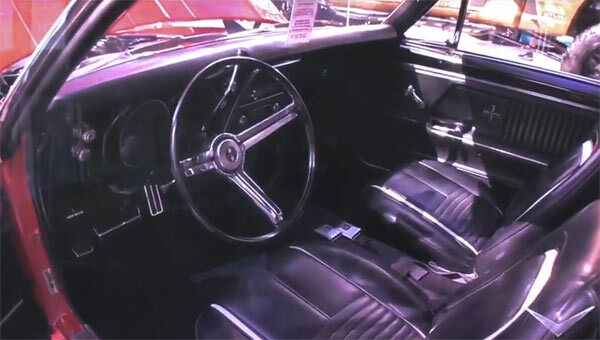 ‘By late 1964, Chevrolet was designing their answer to the infamous Ford Mustang. This process began with the XP-836 design study that would produce scale models that didn’t run out of artistic materials, such as clay, balsa wood, and fiberglass. When this process was completed in the winter of 1965, the potential drive-trains were tested in aesthetically modified Chevy II X-Car Novas, because of the component similarities. At the same time, Fisher Body was working on sheet-metal tooling utilizing full scale sheet-metal modeling techniques for the coaches they would supply to Chevrolet. When these processes were refined and readied for test manufacture…the program was then tasked with the hand building of the first working prototypes. This process would ultimately create 49 working Pilot Prototypes for the F-Car Manufacturing Platform…the First Chevrolet Camaros. These cars would be a landmark achievement and spark the longest and fiercest rivalry to ever come out of Detroit…the Chevrolet Camaro vs. the Ford Mustang. N100013, “The Gear & Axle Test Car”, was delivered on May 31, 1966 from Fisher Body as sub-contracted coach #DD16D. Like all F-Body Pilot Prototypes at Norwood, it started its hand built assembly in consecutive VIN number order as the thirteenth build of the engineering study in a non-descript WWII shipping building at the Norwood, Ohio Chevrolet Plant. This facility was chosen because of security and upper management’s desire to keep this secret project outside the prying eyes of the press and public. One of one on Fleet and Special Order # 5A-26 made by Manufacturing Gear & Axle, it carried model # 12667. 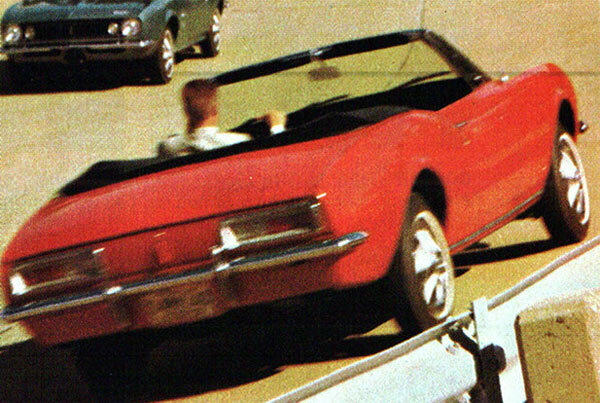 This red on black convertible was the fifth Pilot Prototype convertible ever built. N100013 was hand built utilizing components marked as Handmade, Prototype, and Pilot and was required to be received by the Supervisor in charge, Claire Caswell at the General Motors Proving Grounds by June 14, 1966 for rigorous gear and axle testing under the auspices of Pilot Prototype Reliability Audits. These audits were conducted on-site at the General Motors Proving Grounds, as well as, off-site. It was important to keep this prototype testing and audit process under wraps from the general public, because it was ongoing prior to the official announcement of the car to the press. These cars were tested through driving conditions that were very rigorous and extreme…then torn apart and checked for wear and reliability. New or different components were added or substituted and the process began yet again. The idea was to create real word conditions that could possibly cause failure. These weaknesses would affect the bottom line through warranty and quality issue and these issues were to be dealt with pre-production to the best of their abilities. The Off-Site Reliability Audits were conducted during the middle portion of July 1966. Among notable imperfections gleaned from these audits was the necessity of traction bars for the rear differential and cocktail shakers on convertibles. General Motors Shipping Records show #13 being returned to corporate, Zone 0 where it was used as a company promotional vehicle shortly thereafter, before being sold to the first owner in March of 1967, Tom Kinkelaar, ten months after its birth. As was typical with the Engineering Test Cars…the prototype was equipped with a drivetrain that was capable of being warrantied utilizing a dealer work order. The original VIN tag was then additionally engraved to reflect the purchase date in the absence of non-existent regular production assembly line Protect-o-Plate. That’s where our story takes on a personal flare….Tom Kinkelaar would have #13 serviced locally in Waukegan, Illinois over the years. His personal mechanic, Tom Reuss, would jokingly mark the serial number line of his auto repair orders for the car, “ABYSS”. They would become friends and Reuss would ultimately purchase #13 from Kinkelaar on August 28, 2002. Tom Reuss would begin the journey to document the car for the interest of others almost immediately. He documented the Handmade, Pilot, and Prototype parts and went to great length to save every imaginable piece of the car. This was prior to the creation of Pilot Car Registry and Tom always struggled gaining the factory provenance, as well as, the expert involvement that would prove necessary. Fast forward the clock to March of 2015, when Logistics Expert and Lead Archivist of Pilot Car Registry, Ms. Jamie Schwartz obtained an ownership confirmation of N100013 utilizing law enforcement databases. At that point, the Founder of Pilot Car Registry…Logan Lawson enlisted the cooperation of his volunteers and personally verified the prototype in person in Round Lake, Illinois. Armed with Subject Matter Expertise, the original factory documents, and vintage photos for presentation to Tom Reuss…the two quickly became close friends. This friendship would lead Reuss to once say to me…”I want the boy to own the car someday”. Unfortunately, Tom was diagnosed with cancer in the summer of 2016. A phone call from his wife, Jackie ensued…and Tom’s desire to pass curatorship to Pilot Car Registry and its youthful founder, Logan Lawson was accomplished.